Now this solution is easy to explain. It’s what I have come to know as a ‘between’ analysis. I don’t know if that’s the proper term but it harks back to the days when I used to be a number-cruncher for some statisticians. The deal is relatively straight-forward: compare the fist item against every item after it in the list and store the largest positive difference. If this difference is also the largest seen in the data-set so far then make it the largest positive difference of all points. At the end you just return the two points you found. This is a natural way to solve the problem because it looks at all possible start points and assesses what the worst outcome would be. 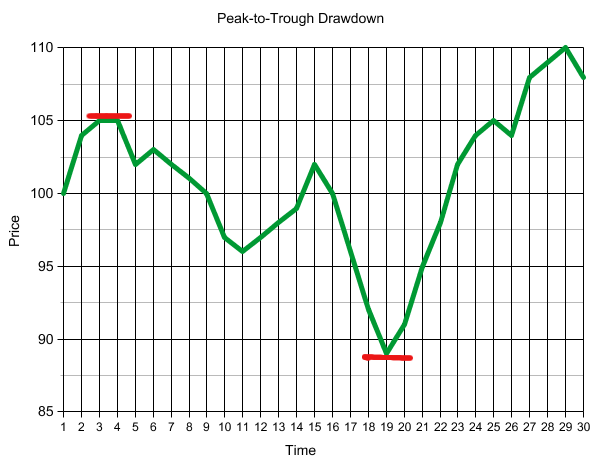 # You can only determine the largest drawdown on a downward price! This solution is a bit harder to explain. We move through the prices and the first part of the ‘if’ will find the highest part of the peak so far. However, the second part of the ‘if’ is where the magic happens. If the next value is less than the maximum then we see if this difference is larger than any previously encountered difference, if it is then this is our new peak-to-trough. The purist in me likes that fact that the O(N) solution looks like easier code to understand than the O(N^2) solution. Although the O(N^2) solution is, I think, an easier concept to grapple with, when it’s translated into code it just doesn’t grok.